On October 25 at 12:00, the Glavkom Press Center (8/20 Shovkovychna Str.) will host a press conference on the persecution and assault that place in Odesa of Ihor Zakharchenko, an openly gay person and active participant of human rights rallies. On October 22 (Sunday) at 11 pm, Ihor Zakharchenko and his partner were attacked at the entrance to the house, where he lives. The attack was committed by two unknown persons. As a result, they inflicted light bodily injuries on Mr. Zakharchenko. His partner is in a difficult mental condition, having panic attacks symptoms. 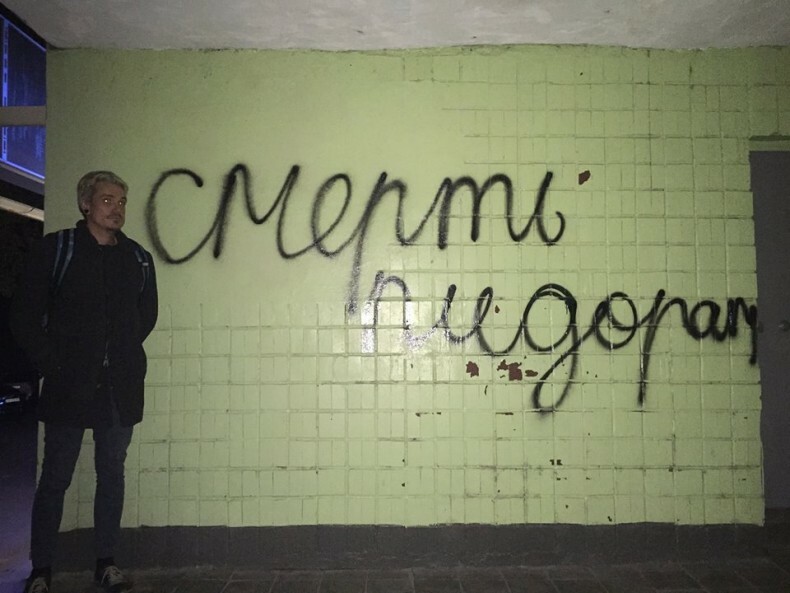 On October 18, at the entrance to the house, where the victim and his partner lived, there were threatening homophobic inscriptions on the walls (on the photo). Since that day, they did not stay at home. This circumstance indicates that the unknown persons could wait for Ihor and his partner at the house for several days in order to commit the attack. The police took inadequate actions and had insufficient reactions to the event. No prompt actions were taken. The case of the attack was not registered. Ihor Zakharchenko has been already attacked for the third time. The two previous cases – the beating during KyivPride in 2016 and the beating in Odesa – have not yet been investigated. Human rights defenders consider the situation to be very dangerous. Persecution, beating, and impunity can lead to more severe consequences. There is an obvious threat to life.